Choosing the right knife for any job can be and often is the difference between the pleasures of a task done well and the frustration of trying to force a square peg into a round hole. Outdoorsmen depend on the quality, function, and reliability of their knives not only as a companion in the woods or on the water but for survival as well. That’s why, when choosing a blade for a job, it is crucial to consider quality materials and rugged workmanship. When you’re looking for a knife that will help you clean game and create or repair campcraft while at the same time maintaining practicality for tactical purposes, one of the best choices you can make is a Cold Steel Tanto Knife. Originating in Japan and carried by warriors under the feuding shoguns before the imperial period, the Tanto was a sidearm and constant companion of soldiers of the day. 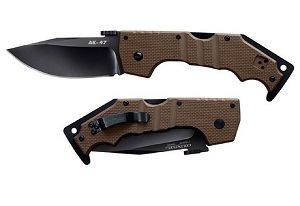 Featuring a straight or, more typically, slightly swept blade with a single edge and what is called a Tanto style point (which means that the belly of the blade forms an angle instead of a sweep as it transitions to meet the point), the Tanto is a blade that is practical not only for bushcraft and survival but also for tactical uses. It is a style that is not only popular but dependable, as proper tempering and the geometry of the blade towards the edge guarantee structural integrity that is often lacking in other styles of blades. A Cold Steel Tanto Knife is a sure bet for quality steel and flawless workmanship while offering multiple choices once you’ve made the decision that a Tanto is for you. From the traditional lines of the Kobun Boot knife, which boasts an AUS 8A stainless blade and a nearly indestructible Kraton handle to the trench tactics inspired Chaos Tanto, sporting an SK5 tool steel blade and a solid aluminum hilt with a D-guard and protruding pommel, there is a Tanto style blade for everyone – perhaps more than one! Carrying an encyclopedic inventory of knives for every purpose from filleting to caping, White Mountain Knives is your go-to for expert blade advice and outfitting. Looking through the expansive list of White Mountain Knives’ offerings, it is almost impossible not to find a blade that seems custom tailored to your everyday carry needs. Featuring slightly modern Tanto blades with Kraton grips, modern folding Tanto blades, and trench-inspired Tantos, there is nothing to be missed. That’s not all, however, because White Mountain Knives carries a blade for every need, from the most respected bladesmiths in the world. When you have a question about what steel, blade, or style will be the perfect match for your adventures, White Mountain Knives is a call or a message away. What’s even better is that their excellent vendor relationships mean that when you know what blade you need before you shop, you can reach out to White Mountain Knives to secure it for you. When a new blade makes the cut for you, head to WhiteMountainKnives.com!